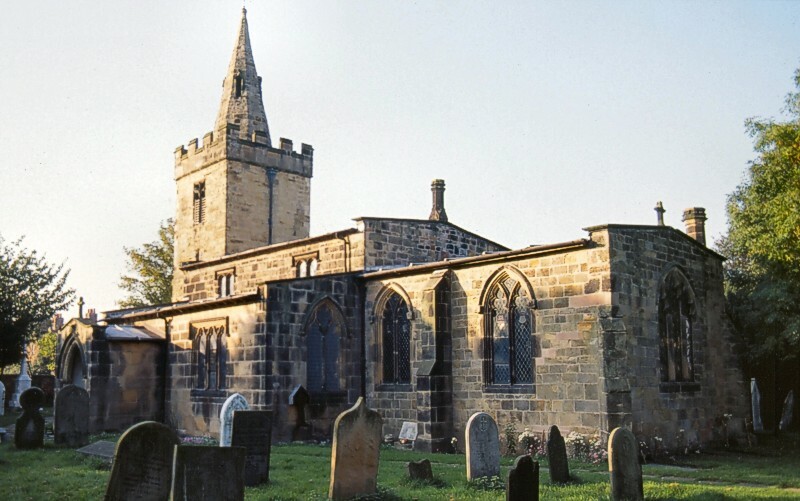 A church or chapel-of-ease at Cossall was recorded in the parish of Wollaton served by the same rector and was in the possession of the Morteyn family from 1236. The advowson of St Catherine’s church passed from the Morteyns to the Willoughby’s in 1312. The church is dedicated to St Catherine, a popular saint during the medieval period. The church was substantially rebuilt and enlarged, with the exception of the tower, in 1842-43. During the rebuilding a north aisle was added, and stone from the original 13th-century church was reused in the present chancel and clerestory. The two-stage tower is 13th century with a 14th-century octagonal spire containing two bells, one date 1733. In the chancel two windows bear the crests of the Willoughby and Morteyne families. In the south aisle there is an early 15th-century small stained glass portrayal of St Catherine, and in the sanctuary an alabaster monument bearing the arms of the Willoughbys of Cossall. During 1999 Trent and Peak Archaeological Unit undertook an investigation during the re-flooring of the chancel, nave and aisles, which provided detailed information of the earlier church. Re-flooring the chancel also exposed the entrance to the Willoughby vault, making it possible for the largely unknown contents to be recorded. and to him and Geoff Buxton for the photographs.